Hi! 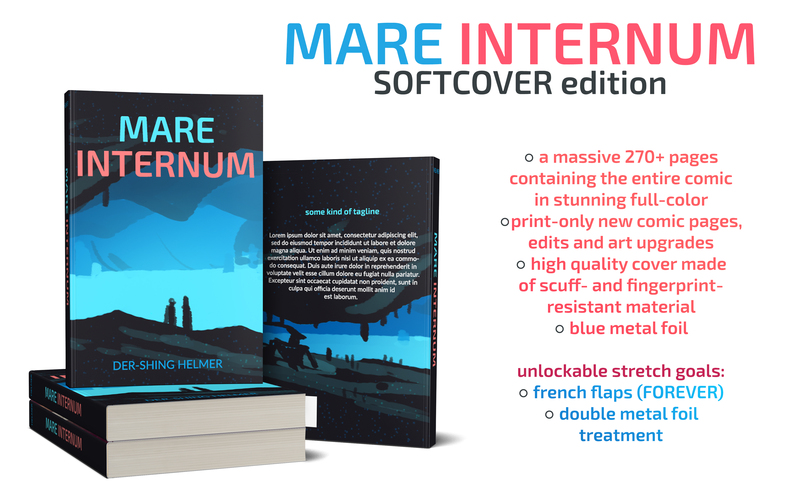 This is the page to preorder the PDF or book of the complete Mare Internum graphic novel. As usual the book will be free to read online in its original form for as long as I am able to leave it up! but the book contains the completely edited, updated and improved art, as well as post-story illustrations. PLEASE NOTE: Preorders will be fulfilled after all Kickstarter orders have been fulfilled. Estimated fulfillment is Sept 2018 for PDFs and Jan 2019 for books, subject to change slightly based on freight times/ other factors out of my control. If you’d like to order a copy of the book with the additional rewards from the Kickstarter (ie one of the limited tiers), a small number of those will be listed separately at a later date, and you can get early access by signing up to the mailing list here. Prices for those will be the same as for the Kickstarter.